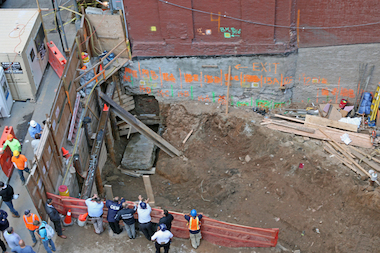 The subcontractor overseeing concrete work at the West 37th Street hotel construction project where a concrete slab crushed a worker Tuesday has a history of safety violations, records show. Rodalfo Vasquez-Galian, 27, of 418 Liberty Ave. in Jersey City, was killed after the block fell on him while he was working on the foundation for the 22-floor hotel at 326 West 37th St. Tuesday afternoon. A stop-work order was issued Tuesday for the entire work location because an approach pit, which gives workers access to space beneath the foundation, was not dug, according to the city Department of Buildings. Federal Department of Labor records show that Park Side Construction, which was responsible for cement work on the project, was issued $11,900 in fines on May 27, because the company lacked safety equipment at an 81 Fleet Place project. The Occupational Safety and Health Administration issued the fine because the company had no fall protection for workers. After Tuesday's fatal accident, the DOB issued a violation to the adjoining building where the slab became detached, 320 West 37th St., and also gave a partial vacate order for the first-floor storefront on the exposed side of the building, a DOB spokesman said. New York State also sued Park Side in 2013 for failing to pay more than $174,000 in worker's compensation insurance, according to court papers. Cava Construction, which is listed as the general contractor for the project on the Department of Building’s website, is owned by Carmine Della Cava, a reputed member of the Genovese crime family, according to court documents. Della Cava “is actively involved in every aspect of Cava Construction’s day to day operations,” according to the company’s website. Della Cava was the driver for the boss of the Genovese organization in the mid-1980s and was convicted of a bid-rigging scheme in the 1990s, The New York Times reported in 2012. Bronx state Sen. Jeff Klein gave $27,500 he received in campaign contributions from Cava Construction to Hurricane Sandy-recovery charities after becoming aware of Della Cava'spast, the New York Post reported in 2012. A representative from Park Side Construction hung up the phone when reached for comment. Cava Construction did not immediately return a request for comment.